There can be no other garments to the home seamstress that feel unattainable, mysterious, and awe-inspiring than couture garments created by history’s greatest designers. As beautiful as they are and after sighing over many for so many years, I recently was also thinking – why just gaze on such garments as a museum artifact? Surely they are not being preserved, archived, and presented just to be admired a hands breath away or be a picture of what you read about in a book on fashion. Could they be there not just to learn from but also to motivate one’s personal creativity? Could they also be seen as a challenge to be understood? How else to recognize or appreciate such stupendous, unrivaled garments unless their mysteries are deconstructed? With these thoughts, I am now set on admiring such garments in a very tactile way, such as attempting the recreate one-off couture garments according to my own personal taste. 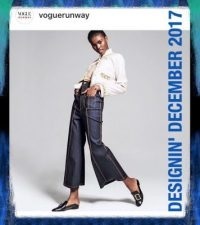 I am by no means claiming I’m in the same position of skill as history’s famous designers, nor do I see this as detracting from the uniqueness of the original garments of such designers when done with the proper respect and credit to the individuality of the existing garment. An original piece from its maker is and will always be unique and unrivalled in matchless worth. However, by trying to think like a designer towards both the sewing craft and the personality of fabric offers many opportunities to learn and advance personal ability. But most importantly, there is the pure fact that by doing so, only increases the value of couture items in the eyes of one who tries to truly “copy” them, helping a sewist to realize the pure genius of designers and couture creators…details that others who know nothing of fabric are completely unaware of. I have already successfully made a Vionnet design. That was an amazing eye-opener. 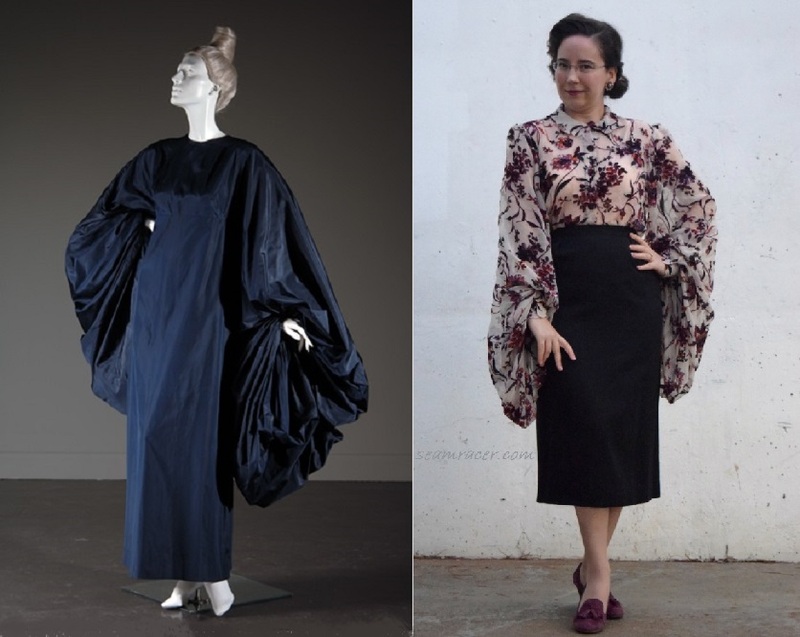 Now, I’ve made my own version of Schiaparelli’s summer of 1937 butterfly dress and mesh duster coat. Metamorphosis from the oppressive ‘shell’ of conventional home sewing habits like the insects on the garment I attempted to recreate is so redeeming and exhilarating. I do feel as if I ‘broke free’ with this post’s make. I did a whole lot of self-drafting and re-designing of existing patterns from the same time period which I loosely used as my base starting point. I started with looking at a garment, understanding it from Schiaparelli’s perspective, then constructing from there. 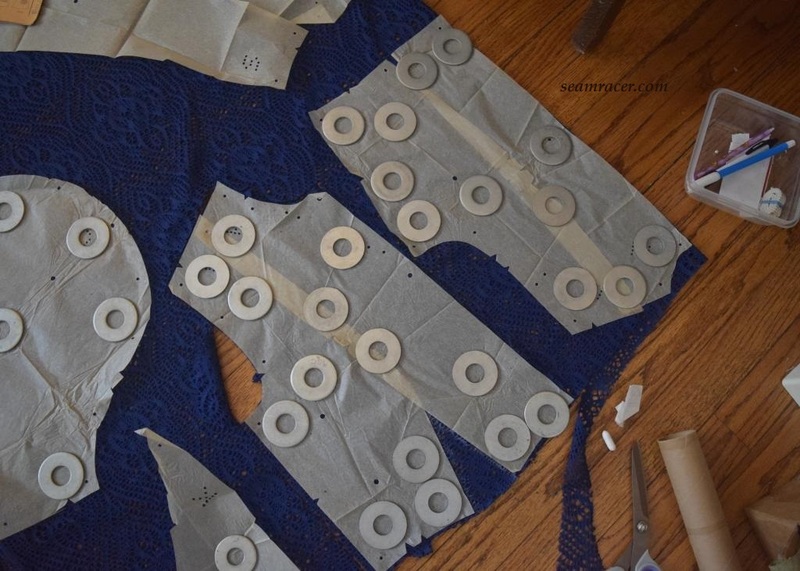 This method is a departure from the “normal” …”what pattern do I pick for this fabric” or “what fabric would go with this pattern” and following directions. As I mentioned above, it was a very great learning process, but it also helped me see proportions and details of garments in a revealing way – this is the most important lesson I’m taking away from this, besides ending up with something so very close to my ultimate dream outfit! Yet, for as wonderful as I feel wearing this, my face might not show because I was trying to imitate the emotionless stoicism of the classical-style 1930s designer photo shoots. Believe me, I’m elated inside! As this is my own knock-off interpretation of a designer garment, this is part of Linda’s “Designing December Challenge” at “Nice dress! Thanks, I made it! !” blog. 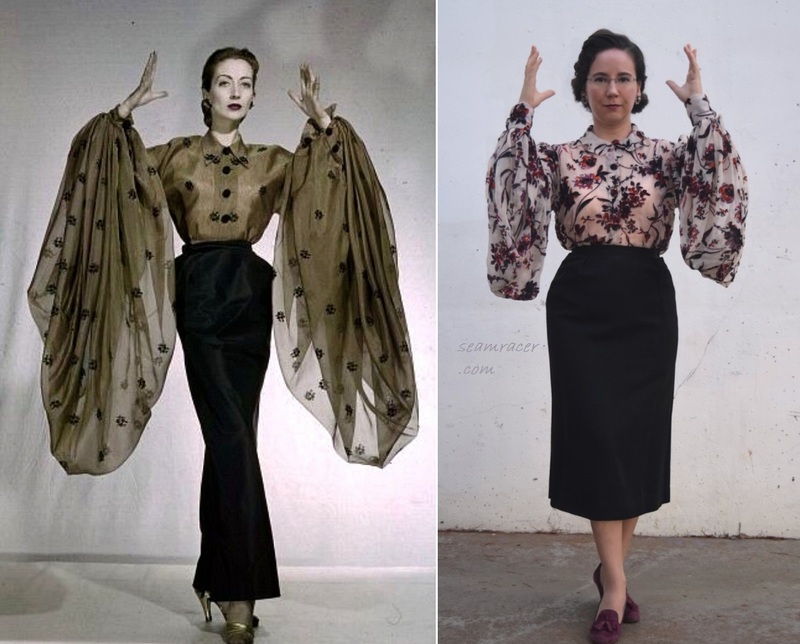 In this case however, from what I have discovered in my research on this particular set from Schiaparelli, my inspiration piece was not actually “designer” in the garment production sense of the word, not even made for commission. It was a couture creation, a one-off, no-duplicates outfit made for her own enjoyment, herself to wear, and for fashion statement purposes, expressing the inner artist that she was. If you would like to more pictures of her original outfit, visit my Pinterest board for that here. 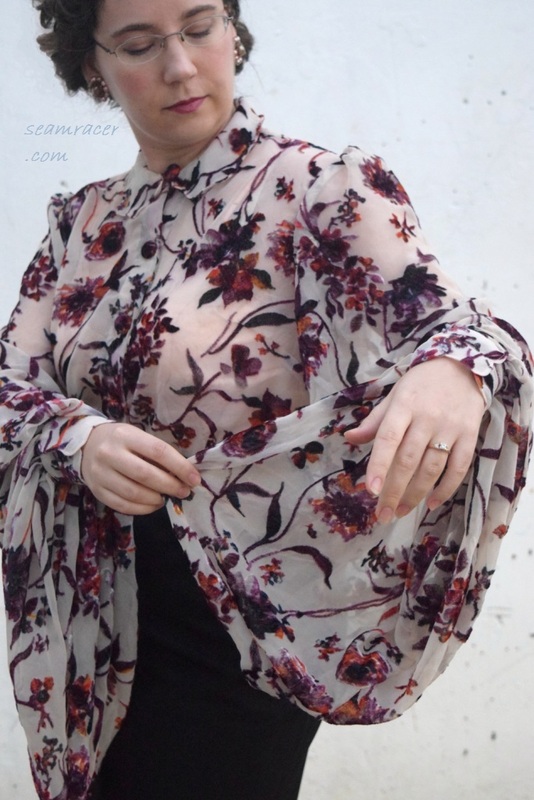 For all that the butterfly print stands for on its own (more on that just below), I personally see this set as symbolizing a lovely elegance half confined, half complimented by the mesh duster coat, like a beautiful creature caught in a net. The hood adds further restraint with an air of shy mystery, as beauty does not always like to be put on display, merely only respected for what is inherently is. Fabric is here both full, flowing, and unrestricted yet also structured at the same time. Fashion can be restricting or freeing, depending on how you wear it, choose to clothe yourself, or follow society’s expectations. We tell others about ourselves by what we wear without ever needing to make a sound…let that message be a beautiful one that’s exactly what you want to say. This outfit says a lot about how I feel in my current sewing skills and where I’m going. FABRIC: My dress is in a thick yet soft premium 100% cotton, a M’Liss brand print from the now defunct Hancock Fabrics. The mesh duster coat is made of a Kathy Davis brand knit, bought from Jo Ann’s Fabric store. PATTERN: Patterns I loosely based my own re-drafted designs on were – Simplicity #3508, year 1940 (made already – see the blog post); Butterick #8078, circa 1939; Simplicity #8447, a modern reprint of a 1940 pattern; and Hollywood #1391, a Glenda Farrell year 1937 pattern. 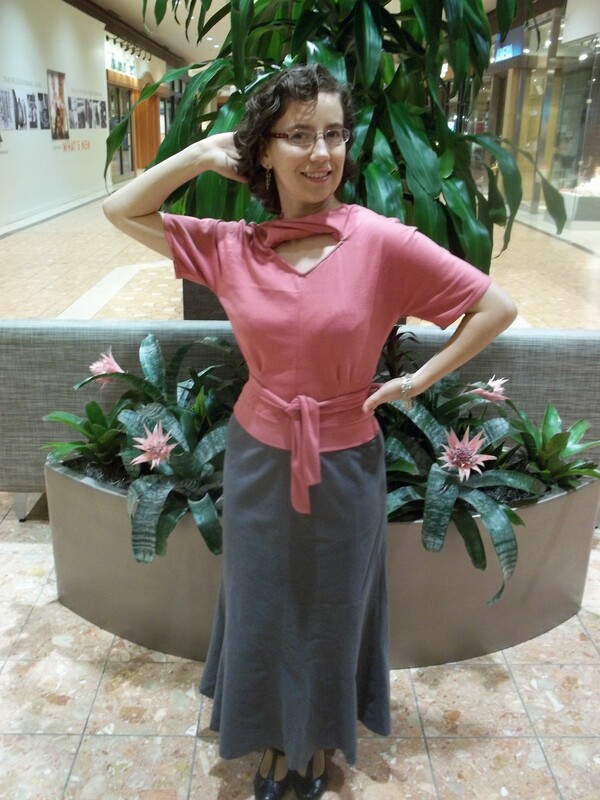 NOTIONS: All I really needed was pretty basic – thread, interfacing, hook-and-eyes, and some ribbon from my stash. TIME TO COMPLETE: The dress was made in about 20 hours (not even counting the many hours drafting and tracing out patterns) and finished on August 1, 2017. The mesh coat was made in another 20 plus hours and finished on August 19, 2017. THE INSIDES: The dress’ insides are left raw to keep the bias free flowing, while the coat’s seams are finished by being covered in grosgrain ribbon to keep it clean, interesting, and stabilized with a hint of contrast. TOTAL COST: The mesh knit for my duster coat was bought over this past summer for about $30 on sale for the 3 ½ yards I bought…it was expensive but so worth it!!! 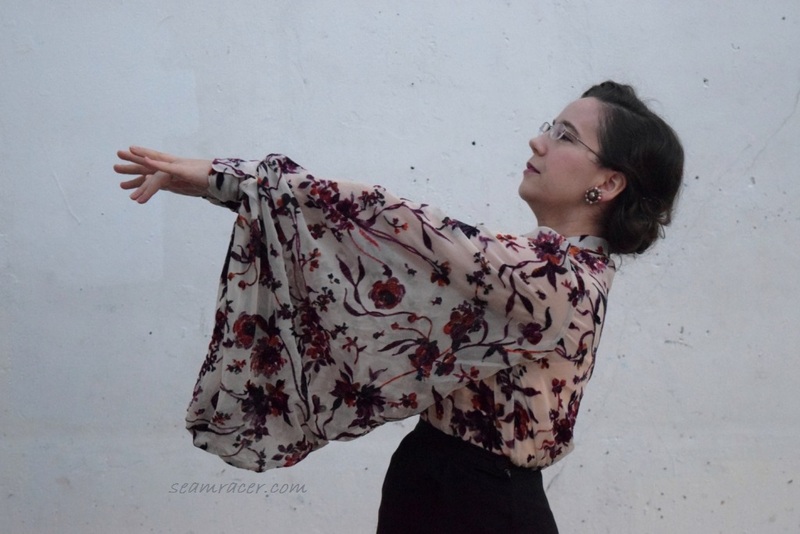 The butterfly cotton for my dress was bought at least 5 years back when I first had the idea to somehow make my own version of a Schiaparelli outfit. After that many years back, I don’t remember cost, but knowing the price of M’Liss cottons I’m supposing about $12 for 3 ½ yards. The rest of the notions I needed only cost a few extra dollars so I suppose my total is about $45, spread out over the course of several years. This outfit has been so long in coming!!! Butterflies were one Schiaparelli’s trademark symbols that she used on many occasions, along with her penchant for postal stamp prints. Butterfly prints were one of the many custom printed fabrics made exclusively for her to create with and 1937 was a big year for it. 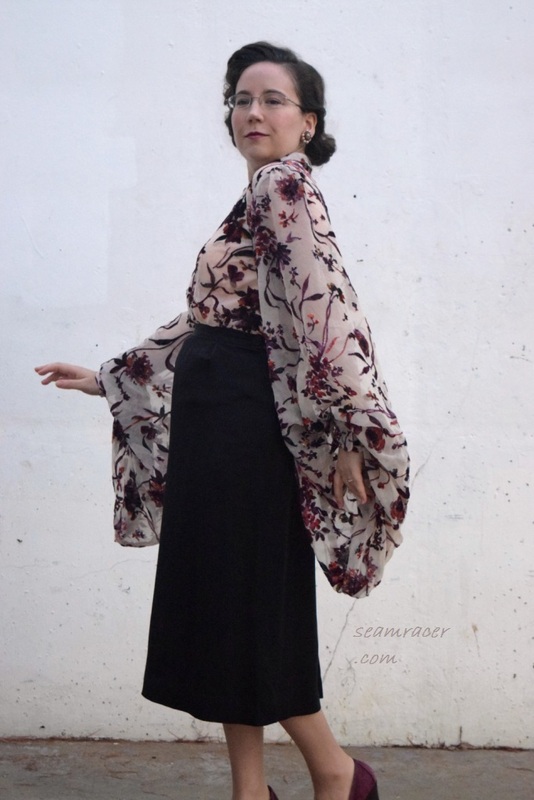 All in butterfly prints, she also made a simple dark crepe evening gown, another dress in a less formal “waltz-length”, a butterfly parasol (which you can see in some pictures we recreated in our own way), scarves (of course, she loved scarves! ), and a suit jacket. Wow! That’s at least half a dozen butterfly creations in one year, counting my own outfit’s inspiration piece. The next year, in 1938, she created an insect necklace and in 1940 she created an evening dress with a dramatic butterfly bodice. Butterfly prints and embellishments have been and are still quietly but perennially popular even today, all thanks to Schiaparelli I would like to say. See this beach set from Versace’s Spring 2018 RTW, or Moschino’s Silk tie-neck blouse for just two examples of butterfly prints for the year ahead, and this Burda Style magazine page from July of last year (2016) for a look behind. Alexander McQueen is another well-known modern muse for the butterfly trend. There can be found random examples of butterfly prints from most of all past decades since her (my favorite is this one from the Harper’s Bazaar in 1942). Although insects were added on many ladies gowns in the earlier Regency period (roughly 1810 to 1820) as well, up until the last 70 years insects were seen as something oddly repulsive and unusual to have on women’s wear. So, technically she wasn’t starting anything completely “new”, just finding a whole new way to express it to a receptive audience at the perfect moment in time. People seem to have moved on from a fabric print or clothing decoration reminding them of creepy crawlies on their body. 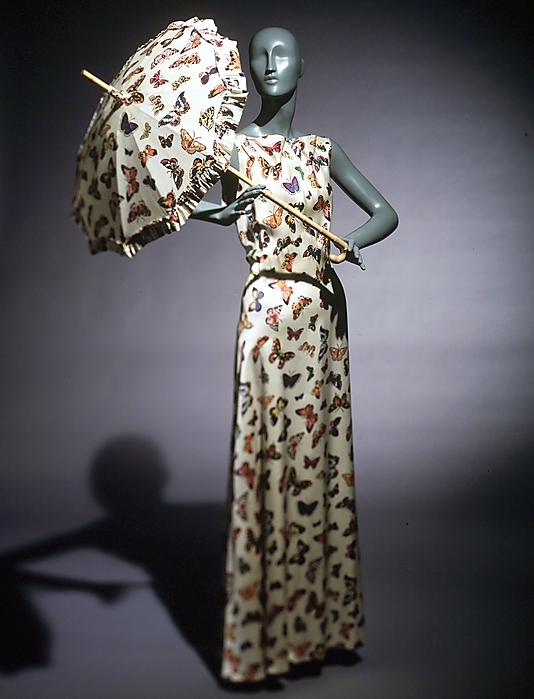 I’m assuming that the popularity of butterflies in fashion has been lost in the muddle of frequent use and is not manifested for the same lovely reasons as the ones Schiaparelli for which was entranced by the transforming creatures. Elsa Schiaparelli felt that she herself and many of her friends and clients did not have the expected societal norms of beauty in face and/or figure. The manner in which one has to wait and see through the unsightly caterpillar stage to see the final gloriousness of the flying butterfly stage gave a message of internal beauty and hope for redemption. Also, a butterfly was also seen to mirror the work she could do with her garments – the way a well-designed and expertly constructed piece of clothing can transform any body into something only imagined is indeed magical! Besides, there was the Surrealist movement’s influential touch, of which she was a major participant in as she was friends of artists such as Salvador Dalí, Max Ernst and Man Ray, often collaborating with them on sewing projects. The Surrealist movement wanted in itself to challenge accepted notions and ways of thinking, and find new outlooks of seeing everyday objects and situations in a new light. Using butterflies showed their desire for change, offering the unexpected in a background others can generally relate with in a way that dares our set conceptions. 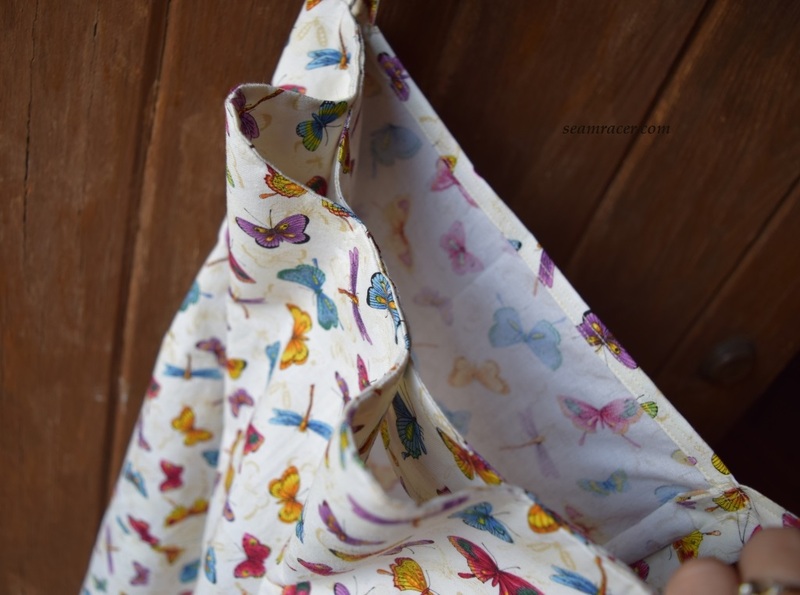 My own fabric is admittedly not entirely butterflies – it also includes dragonflies. However, I see this as very appropriate and only adding to the message. Dragonflies also undergo a sort of metamorphosis – they live a good part of their lives as ugly, mud-colored slightly monstrous looking nymphs or naiads in the water. Then they come out of the water to break from their shell complete with beautiful, sun reflecting wings to enchant us with their color and agile movements. Sadly, the stage that we know them by out of the water is the end of their lives, only lasting a few weeks or so of bittersweet beauty. 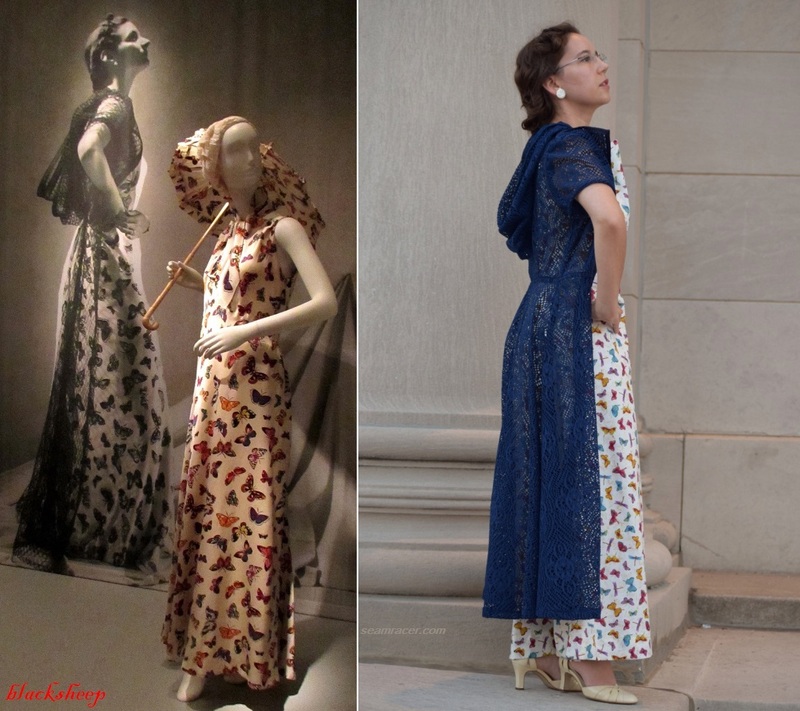 My fabric is also only a basic cotton, while Schiaparelli’s original sundress was a fine silk satin. If these facts don’t further embody the whole “transformation of understanding loveliness” ideal, I don’t know what will. 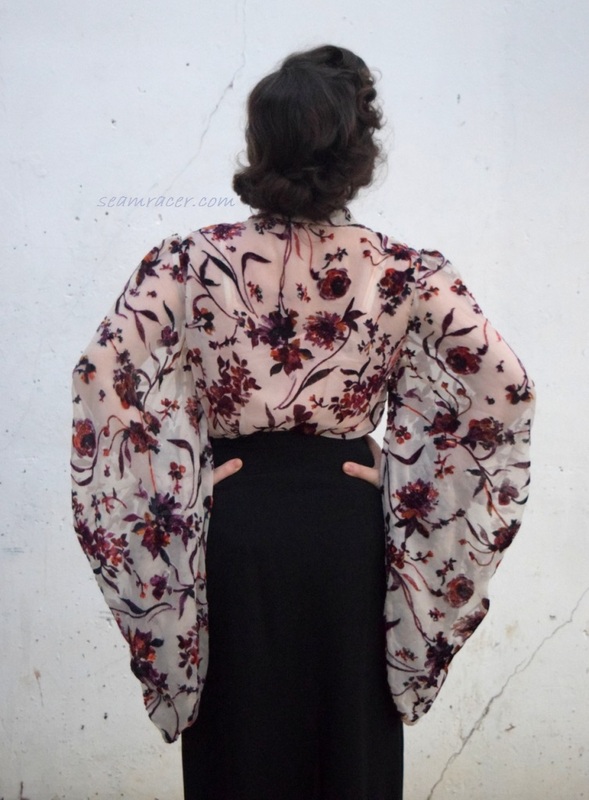 From what I have seen on juniors and teens patterns of the late 1930s, Schiaparelli butterflies were popular in print and style suggestion with young fashion. 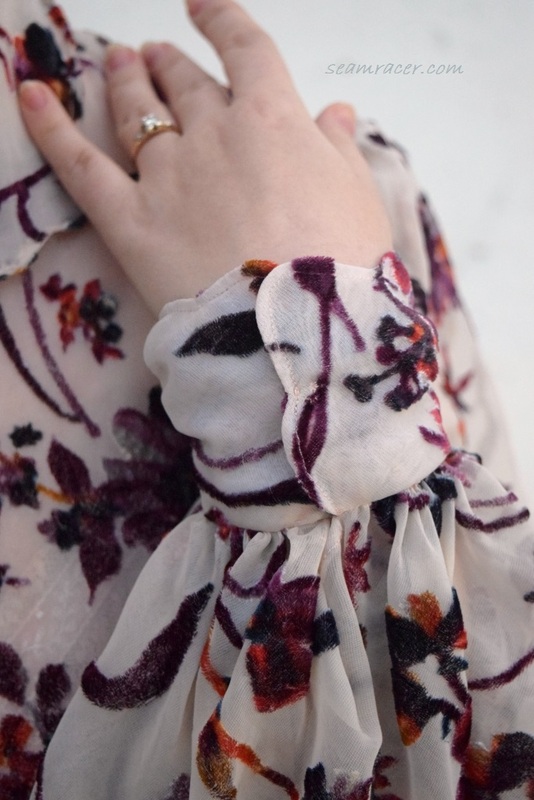 I have seen several patterns with giant poufy sleeves which are gathered down the middle to resemble butterfly wings at the top of the arms. 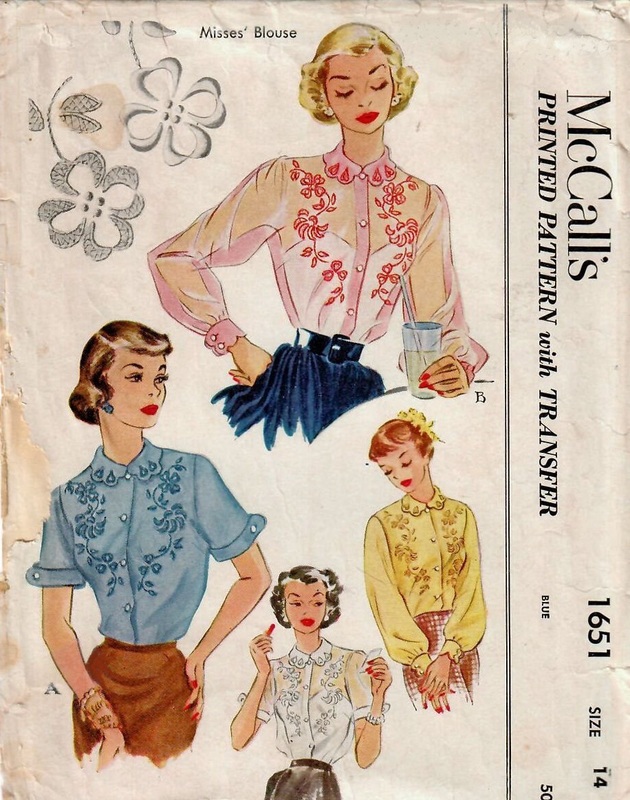 This McCall #9335 pattern from July 1937 is the best example of young ladies’ Schiaparelli inspired style! In fact Schiaparelli’s style in general was popular with the youth and it makes sense that the younger people (besides her rich socialite clients) would be happy and willing to accept her idealism. 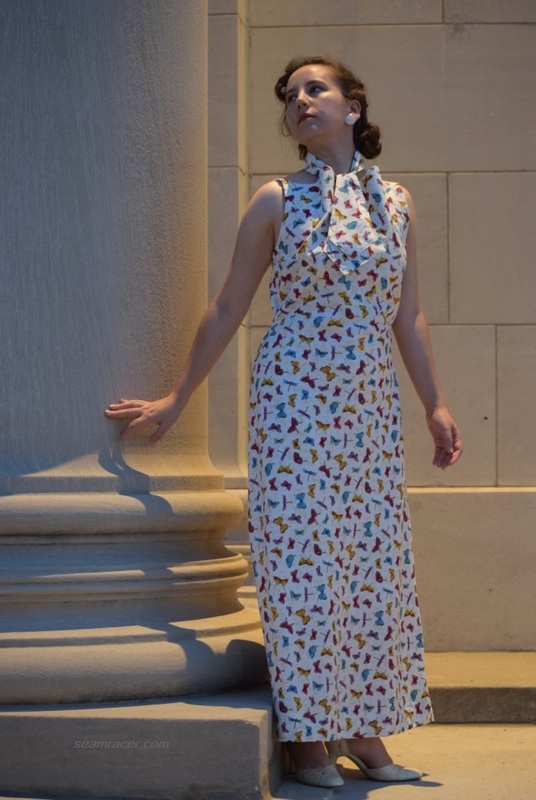 Thus, I found it appropriate to use another junior misses’ design, a Butterick #8078 pattern from my stash, as the base to adapt and redraft my pattern for this sundress’ bodice. 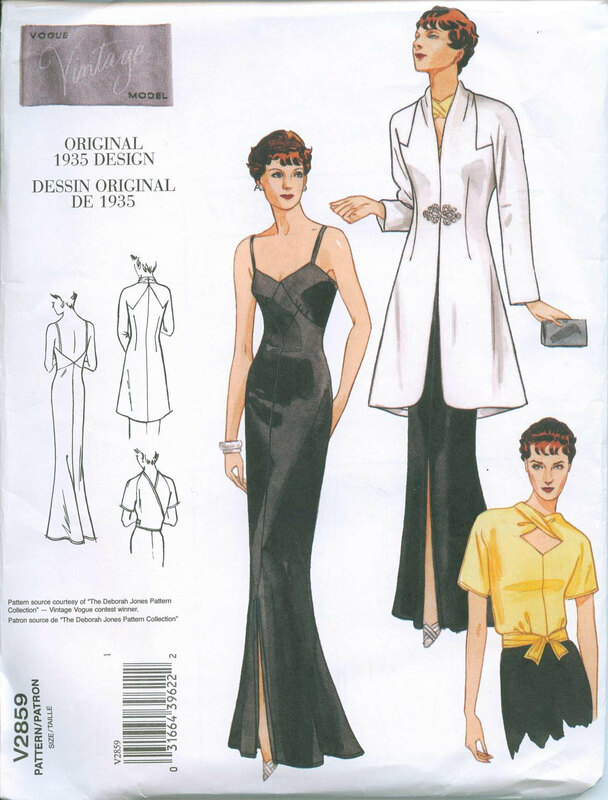 Butterick is a year 1939 juniors ensemble which reminds of the style of Schiaparelli (in the late 30’s Butterick came out with a few “designer inspired” patterns). It is very similar to her fascination for playful yet structural interest around the neck, face, and shoulder line that would reoccur every so often (see this 1948 winter set with even more exaggerated features than my sundress). It was the neckline that takes the main interest and was the greatest challenge to making this dress. I had to put myself in the mentality of working with the nature and drape of the fabric to figure out how part of it can be so structured yet supple, with the rest flowing on the bias. 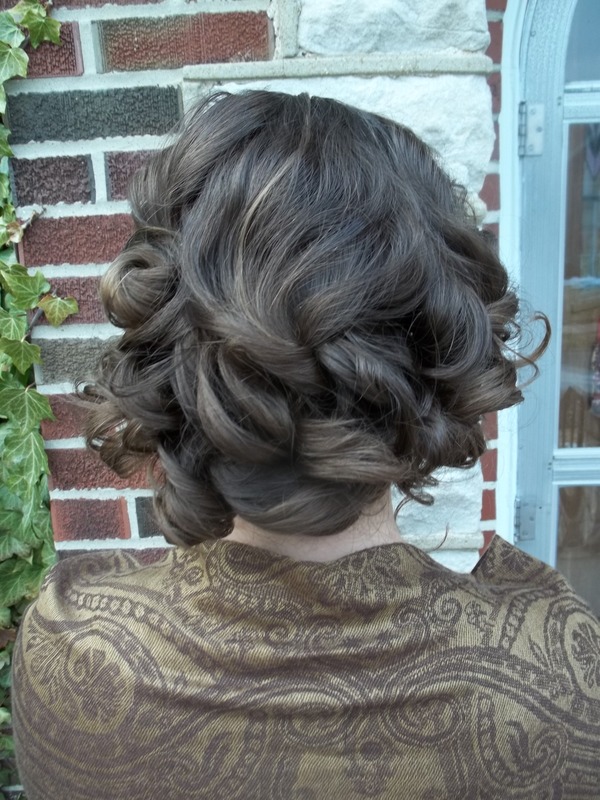 In the end, I interfaced the edge about 5 inches down from the neckline edge, and faced it. 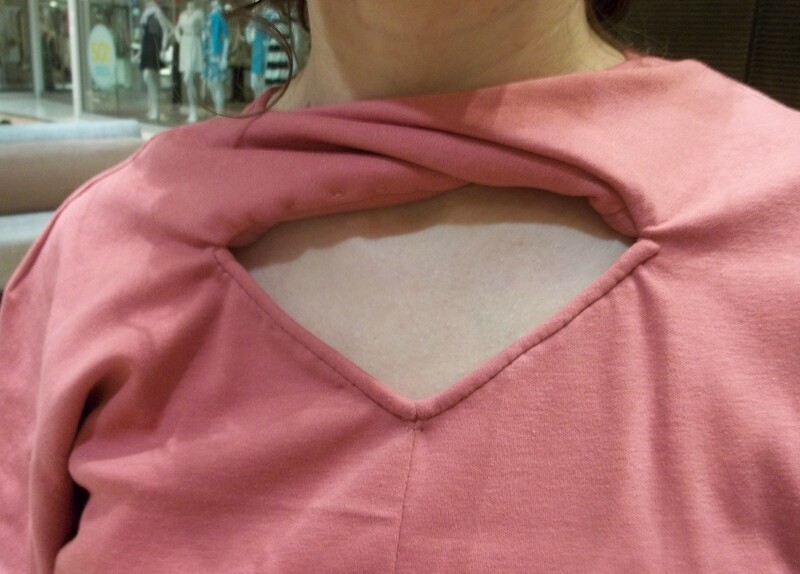 Then a self-fabric, interfaced strip was attached underneath to invisibly hand tack down the neckline rolls. Interfacing the straight necklines worked out well to keep them crisply linear and support the rest of the long dress. I have no idea if this method is anything close to how Schiaparelli engineered her neckline, but this was the way that seemed the most simple and made the most sense to me. She probably made her neckline in some way that would blow the mind. 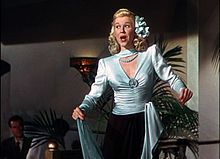 I realize the original dress had some sort of soft pleats at the front ends of the neckline, where the shoulder straps join. 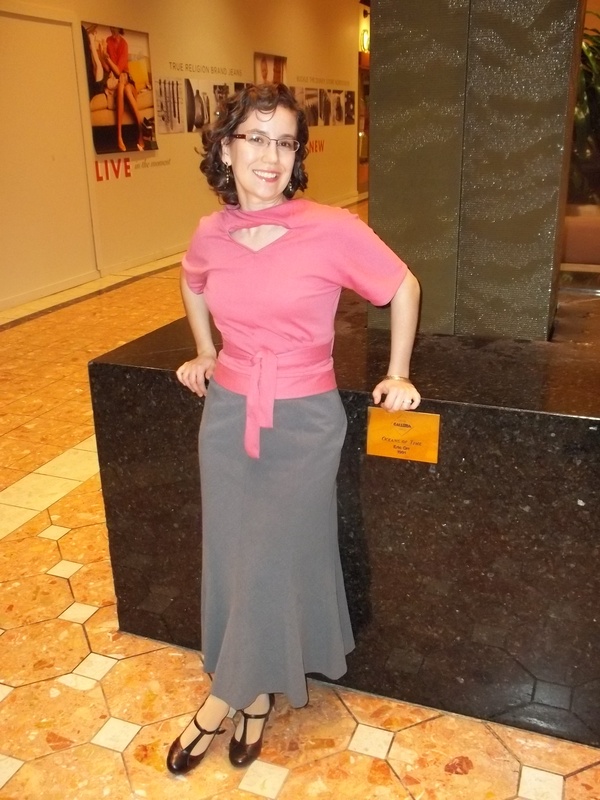 But as my dress did not seem to like that in the front, I let the fabric do its own thing and keep the pleats in the neckline ends at the back only for a smoother front. I do love how the wide neckline over-exaggerates the shoulders how have a strong T-silhouette to lengthen the body line in this bias dress. The original dress had deep armholes and I followed that on my copy to have the free and breezy free arm look of this sundress. Luckily, though, my placement of the sleeve straps and the armpit dip was adjusted so that I can still wear my regular lingerie! Schiaparelli’s original dress also had an inverted-V bodice which comes to just above the hip bones at the side seams. The bodice also has a slight poufy fullness to it at the seam, with a two piece bias skirt below. 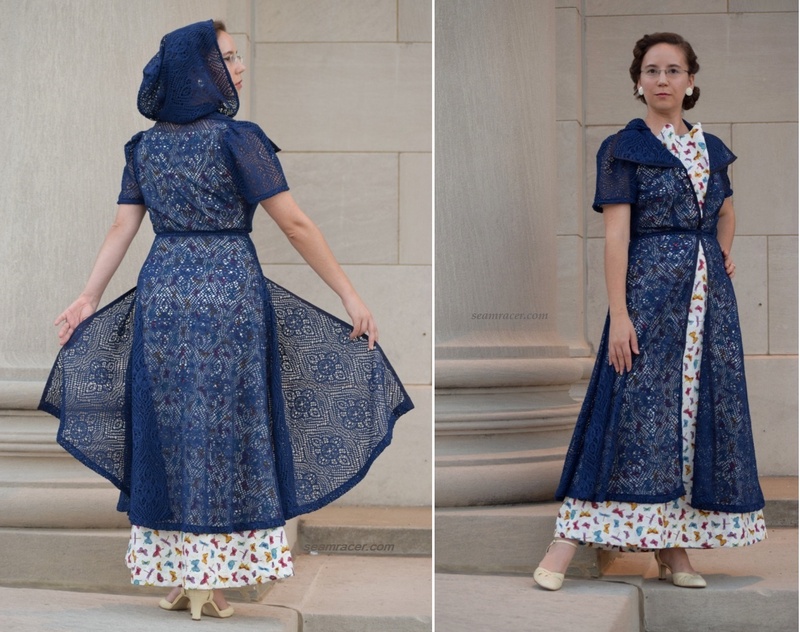 I was able to get all of this by redrawing the bodice and skirt of my nightgown Simplicity #3508. However, to further shape my dress, there are tiny tucks in the skirt where it meets the points of the bodice at the side seams. This is where I realized proportions are very important to get a specific fit and drape on the body for the desired effect. I also realized there is no closure needed, amazingly…this is one of the most elegant slip-on dresses I could have imagined! For the mesh over-jacket, I realize that Schiaparelli’s original was more of an open netting over a tighter, smaller netting. Mine is similar in styling and ideal, and every bit of luxurious practicality. 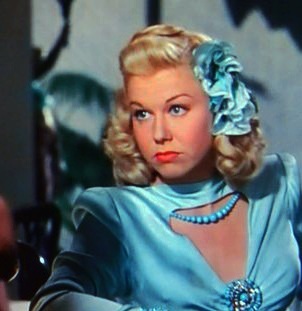 I mostly stuck to the original basics of Hollywood #1391 from 1937 (the right year!) to cut it out. I over-laid the pieces together so that there would be none of the original princess seams and therefore minimal design lines. The main seams were going to be clearly obvious and showing – that is part of the intended appeal – so I was paring unnecessary ones down. Where the princess seams had been, I changed the amount of difference to simple darts above and below the waist instead. 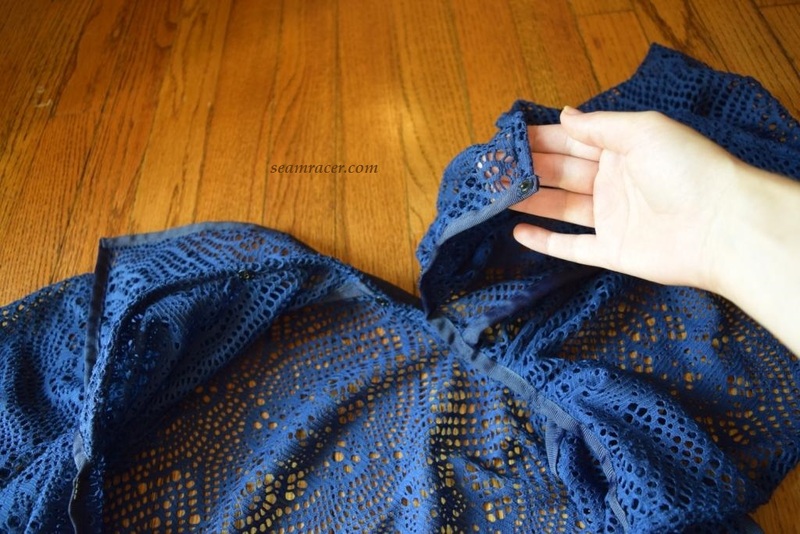 As I was working with a knit, and it was only a jacket, this was also a very good fail proof way to sort of muslin this Hollywood pattern since I intend to make another version into a dress at some point! It was really the easiest part of the whole set to make, just tricky due to the open fabric. 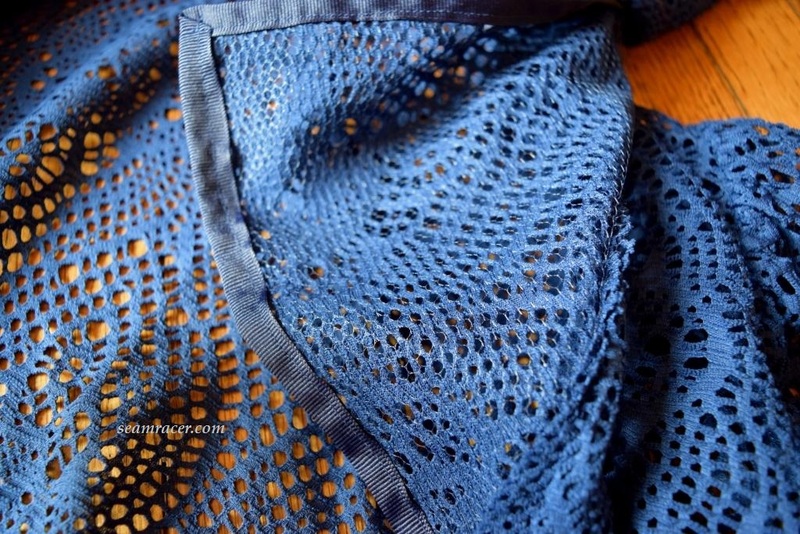 The pointed collar to the jacket needed to be interfaced and have structure like the neckline of the sundress underneath, so I used navy blue mesh tulle netting. This worked like a charm and indistinguishable! I also added inner sleeve cap supports of more tulle at inside at the shoulder tops so that I would have uber-poufy sleeves that would obnoxiously stand out on their own just like on the original! I could not find what the hood on the Schiaparelli original looked like in shape so I allowed myself whatever was available. 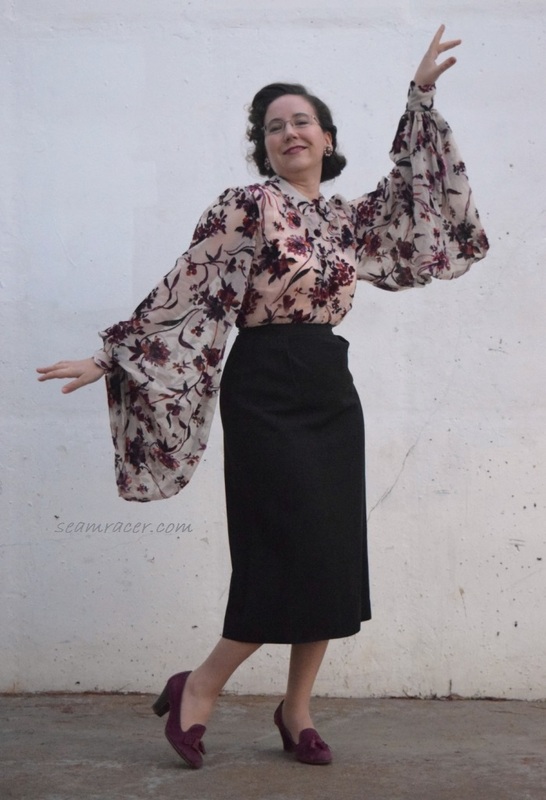 The new Simplicity vintage winter and fall 1940 separates was an opportunity to again test out (at least, in part) a pattern I want to make again, and stick to the same time frame of years with the patterns I am using. 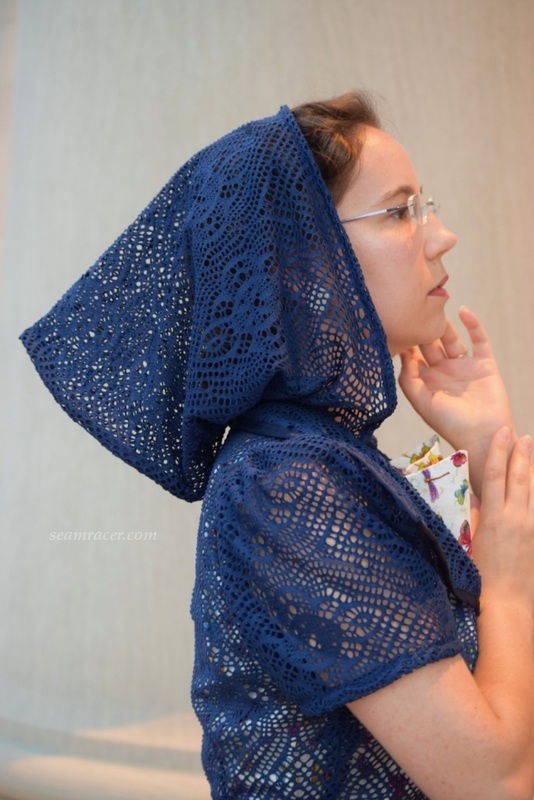 I had no trouble making the hood, although I needed to add in an extra pleat to make the neckline smaller. Only, I liked the way the jacket looked both with and without the hood! I didn’t exactly want to commit to one or the other, so I made the hood removable! How? I added half a dozen snaps along the bottom of the hood to match with other side of the snaps in the inside of the neckline to the jacket. I will definitely make the next hooded dress, jacket, or whatever I make with it removable in this same way! 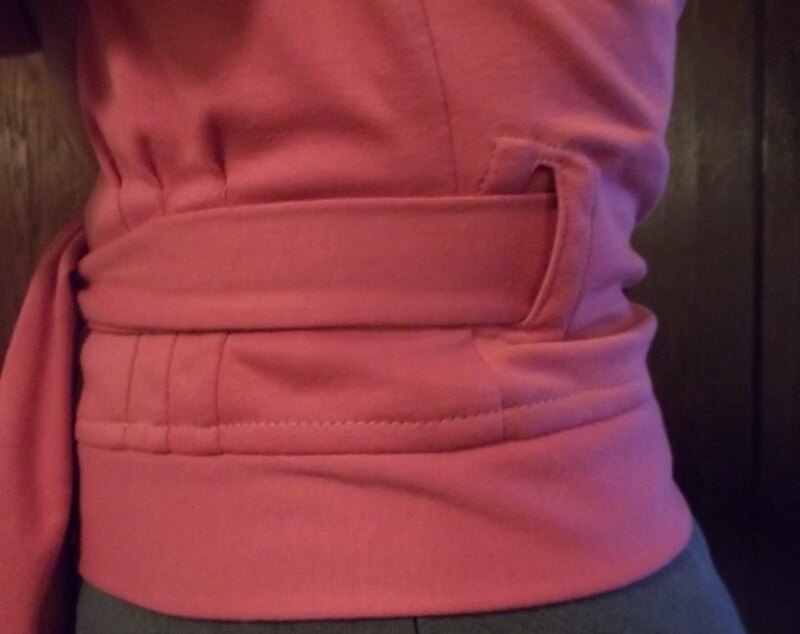 The front of the jacket has the option to close with sliding hook-and-eyes. 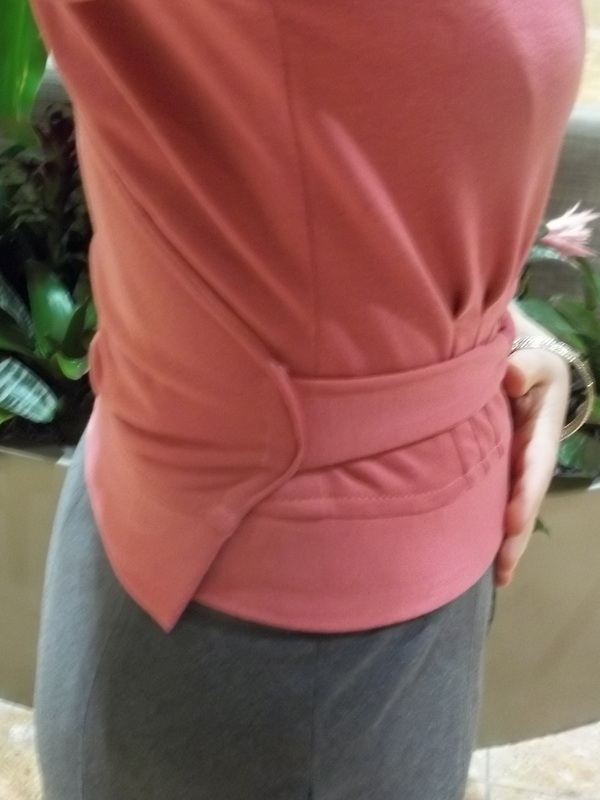 Most of the time I like it open, or just the one at the waist closed. 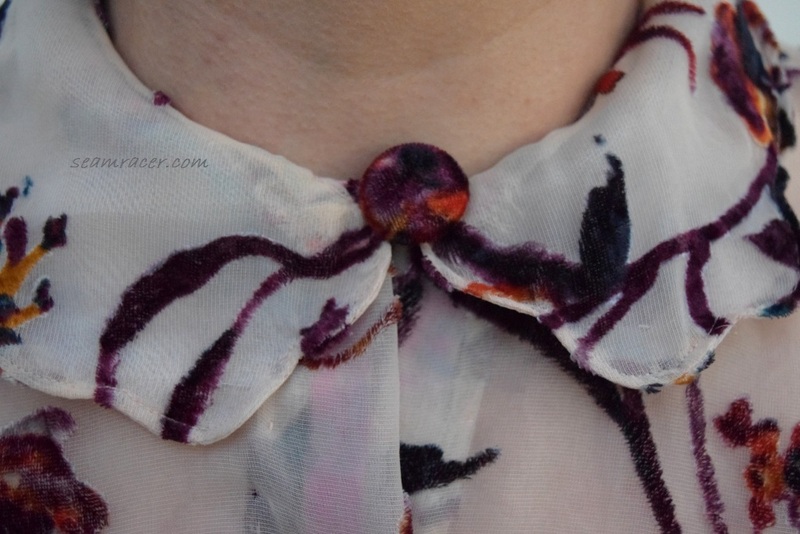 When I wear the dress’ matching neck ascot scarf with my jacket on, it really has the summer ideal of winter bundling! Surrealist contrasts in action! 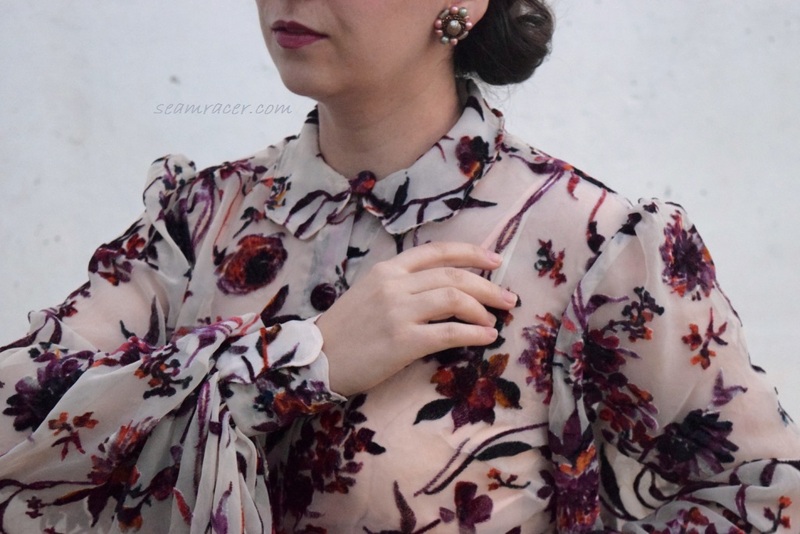 To complete my outfit, I adapted a long rectangle scrap of my dress’ fabric to have flared ends and interfaced inside with organza for an easy ascot. My wood and fabric parasol is something I acquired about 12 years back at a re-enactment. It has a simple floral design hand-painted on a small section of it. What I did in the blank section to simulate idea of the original matching parasol was to add a handful of my Grandmother’s many butterfly pins and brooches. Butterflies had been a source of joy and interest in her life, especially as she had a thriving flower garden for many years. She loved nature and appreciated it in a way I can only wish to emulate. Butterflies have a way of entrancing us. Their fragility yet endurance and strength lends a mix that is their privilege. Their freedom to come and go across our path as they please, to randomly and unexpectedly light up a moment in our life, is no doubt a big part of their charm. A favorite author of mine, Nathaniel Hawthorne, once said that “Happiness is like a butterfly which, when pursued, is always beyond our grasp, but, if you will sit down quietly, may alight upon you.” I’ll leave you with that.